Chris Johnson led the Arizona Cardinals in rushing despite missing the final five games. 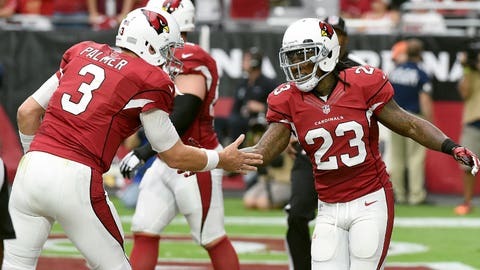 Running back Chris Johnson needed the Arizona Cardinals to win one more game this season to get back on the field. Now, he faces an uncertain future as one of 17 free agents for the Cardinals, whose season came to an abrupt halt with a 49-15 drubbing against the Carolina Panthers in the NFC title game. RB Chris Johnson, a scheduled free agent, would love to be back. Thinks it could work since his skill set is different from David Johnson's. Signed in mid-August, Johnson was among the league’s top feel-good stories of the season before he suffered a fractured fibia at San Francisco on Nov. 29. Johnson was placed on the injured reserve-designated to return list and was not eligible to play unless Arizona advanced to the super Bowl. Johnson was elevated to the starting job when Andre Ellington was hurt in Week 1. After dealing with an offseason gunshot wound and coming off the worst season of his career in 2014 with the New York Jets, Johnson rushed for more than 100 yards four times in a six-week span. Once Johnson broke his leg, rookie David Johnson played superbly as the lead running back, rushing for 378 yards in his first three starts. Still, Chris Johnson believes their is room for both players in the backfield.